A funnel is a series of pages that lead towards a conversion (a business goal you'd like the user to accomplish such as a signup or a purchase). Tracking the entire funnel path from the beginning allows you watch sessions where potential conversions are being lost. Each page that's important to us is a step in our funnel. After inputting our funnel steps, we can see that there are 1,783 sessions where a visitor visited a product page, and 767 of them end up proceeding to the next step in the funnel and add the item to their cart. Of those sessions, only 552 of them resulted in a checkout. Notice that we're using the "Exact URL" match in every step except for the first one, in which we used "URL begins with". This is because we'd like to match any URL that begins with www.mysite.com/view_product/ (so that we can match any product ID at the end of the URL). We could have also used the "Pattern Match" option instead of "URL begins with" and used a pattern like: www.mysite.com/view_product/*. The funnel tool lets you find and watch screen captures where a visitor completed some steps in your funnel, but didn't make it to the end. Watching these screen captures can shed light on why they abandoned the goal. In our e-commerce example above, we're interested in watching captures of people that added an item to their cart but never proceeded to checkout. 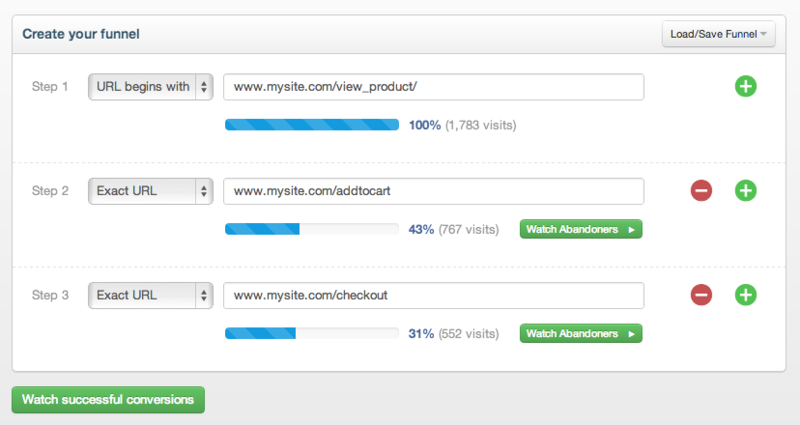 It looks like we lost 215 (767-552 = 215) potential sales because these visitors never clicked checkout. Clicking the "Watch Abandoners" button on a particular step lets you watch sessions that made it to the previous step, but abandoned that step. Watching successful conversions can help you discover what leads to conversions, so that the successful path can be highlighted. To watch sessions that reached the end of your funnel successfully, click the "Watch successful conversions" button. In our e-commerce example above, we might be interested in watching successful conversions to spot potential additional activities that people who purchase items like to do on our site. For example, we may discover that everyone who converts successfully first visits the FAQ page and reads about our 30-day refund policy. Does the order in which visitors perform the steps matter? In order for a session to count as a successful conversion, visitors must visit all the pages in the funnel. The order in which they complete them does not matter. What if during the middle of the session the visitor views a page that isn't part of the funnel steps? Not a problem. If a user views a page that isn't in the designated funnel path (such as an informational/contact page) but still visits all the pages in the funnel, the session is counted as a successful conversion. Page views that aren't in your funnel are simply ignored by Inspectlet.